Don't worry, I didn't have to rip my sweater back to the beginning, I just needed a knitting image to go with the post title. Part 1: The rut. Being in it. Etc. When you fall out of the habit of making things, sometimes the smallest stumbling blocks seem insurmountable. You take a short pause, get stopped up or stuck... and then somehow it's months later and you can't remember where you keep the extra bobbins or where your elastics are or how the hell to do a wrap and turn. By you, I mean of course, me. It's been a long time now — nearly four months — since I mentioned I was struggling on a few fronts that were keeping me from crafting: Struggling with my daughter's life-threatening food allergies and debilitating severe chronic eczema. Struggling with a strict budget. Struggling with lack of sleep (due to afore-mentioned toddler eczema). At the time I hoped it was all temporary, and in a month or so I'd have it sorted. But bad turned into worse, and temporary into never-ending. I'm afraid I even stopped reading all your wonderful blogs because it hurt too much to feel so behind and so out of the sewing and knitting loop. On top of the above-mentioned, the minute my sweet girl started preschool, she (predictably) began catching every cold virus known to humankind. She'd get minor sniffles and a cough and be better in a few days... but between my sleep-deprivation and my own seasonal allergies, I began getting repeatedly seriously sick. Not cold sick, but fever and chills and fatigue and aches sick for weeks on end. I'd get well for a few days, begin to get back on my feet, try to catch up on my life and work and chores... and then the whole cycle would start again. So. How does this relate to "knitting therapy"? Part 2: The knitter on the subway. Recently I was trying to keep my eyes open on the subway train after yet another horrible sleepless night of trying to soothe my daughter as she cried and itched and scratched from head to toe from her severe eczema. I was feeling pretty distraught and sorry for myself, and just generally glum and anxious and worried and tired. I was worried that the latest expensive time-intensive eczema treatment regimen would just be another bust. I was tired of all the well-meaning advice and comments from strangers on the street alarmed by the cracked, flaking, inflamed, infected red rash covering her face ("What's wrong with her face?" "Have you tried Vaseline?" etc.) I worried that I had distanced myself from my friends, and that the people around me that I hadn't pushed away were probably sick of hearing about nothing but my little girl's food allergies and eczema. I worried that the slight sore throat I had was a harbinger of yet another miserable few weeks of illness. Across from me on the subway there was a knitter. I found myself watching her calmly click-clacking her needles, working her way stitch by stitch through a thick wooly gray — scarf? sweater? it was unclear. I have no idea what was going through her mind, but she seemed utterly relaxed and absorbed in her work. 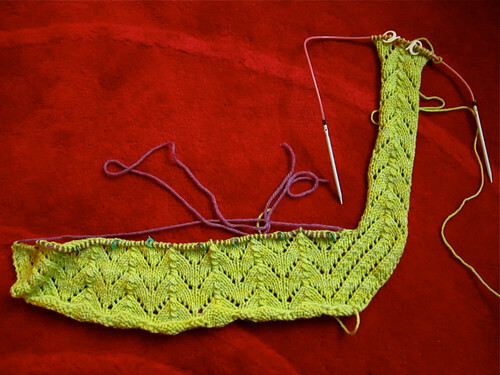 And I remembered my soft chartreuse merino Georgina cardigan, the one I had near-finished in September. I realized the only thing that had kept me from moving to the next stage was that I just hadn't taken the time to search for the size 6 double-pointed needles I needed to pick up and knit the sleeves. I didn't get around to searching out the needles just yet — I barely felt capable of putting my clothes on the right way front in the mornings – but I felt a tickling at the back of my brain. Then I was watching an online webinar about the latest advances in managing pediatric eczema (yes, that's how I occupy myself these days) ... and the doctor presenting mentioned that they had some success in teaching children to keep their hands busy with knitting as a way of distracting them and calming them and stopping them from scratching their rashes and infections. As a kind of meditation. Part 3: Digging out the DPNs. It still took me a while. But, a few mornings later, while my husband packed me a lunch and got my daughter dressed, I found a few moments to rummage through my knitting drawers and find my size 6 wooden DPNs. I began to knit again on my lunch break (I didn't want to mess with DPNs and short rows and lace and picking up stitches all at once on a crowded subway). It came back to me — mostly, though I had to look up tutorials on short rows and even which direction a yarn over is supposed to go (really). And I can't describe the feeling of relief and calm that came over me — even amidst the sleep deprivation and anxiety and worry for my sweet little girl — as the soft wool fed through my fingers and I clicked the needles back and forth. Anyway. The title of this post is a bit of a joke, but a bit not. When you're really low, there is something to be said for the calm that comes from making things with your own hands, with doing something that is just complicated enough to absorb most of your attention, but not so much your mind can't wander a bit or you can't speak. Part 4: Relearning the habit. I really miss you all (am I still in your feed readers?) though I can't make any promises that I'll be back at active sewing or blogging or even blog-reading any time soon. But I no longer feel totally interrupted in my crafting, and maybe I can relearn the habit of never not making things, even in the small moments I have available to me. On another front... my daughter's eczema has been so frighteningly bad lately that I couldn't possibly show any photos of her sweet little face here. But today, a new regimen we've been trying has been having some tentatively positive results... and we were actually able to take a family holiday photo. This is a huge deal. I cannot say that I understand where you're coming from with the eczema, however I can understand how you feel with the rest of it-especially being sick. Last year, I got sick in the middle of October and I was sick until April with no more than a week of being healthy in between the sicknesses. And, trust me, there was only one week and the rest of the time I only got a couple days. Sometimes I would get the same sickness twice. It sucked. At the same time I also suffered a miscarriage. Needless to say, I did no crafting during this time. I was sick and depressed. However, in mid April I went back to my machine and I picked up my needles. Sometimes, we put crafting aside for a little while, but the best thing about it is that it's always there when we're ready again. I am really sorry that you're going through this right now. However, just remember that it will get better and it could ALWAYS be worse. Oh Michelle! Big hugs—like you said, not the exact situation but you have my sympathy and I know what the constant sickness is like. Thank you so much! That sounds hard; I hope things will look up for you soon. Both my children have/had eczema, though not on the face. DS outgrew it at about four years; DD (almost 7 yo) still has it on her hands. Third party comments are/were the worst for me; do people really think you don't notice and try anything to help your child? Hang on, it'll get better! Oh I know—it's as though they think that somehow I mysteriously haven't noticed my child's face.... I feel like saying "Um, I spend hours every day putting special compresses on her face and layers of medications and lotions and ointments, and actually, her face looks much better than it would if I hadn't done that!!!" But I usually just nod politely and try to get out of the situation. Poor. poor little girl. It's so hard when our kids are sick, and harder still when that prevents us from... well, from doing anything. My daughter is fortunately well for now, but life and her high energy needs mean I have no time or energy for crafting or anything much that uses my head, and I'm going mad (quite frankly). I'm Cranky McCrankypants and just horrible some of the time/ I hope that you, and I get some quality time with something that keeps us sane. Glad to read from you again, but I understand completely if we don't hear from you in a while! Stay well, and all the best for your little one. Thanks Sarah, I know the feeling... I hate being so cranky and glum, I get glum and cranky at myself just thinking about it... it's a vicious cycle! I'm sorry to hear your family is going through a rough time. Poor girl! My son had a nasty eczema patch on the entire left side of his face for several years. It would clear up for 2 days, then turn red, crack, ooze, and start all over again. The process took a few weeks to unfold. People were very rude to us, and I overheard some teachers making fun of him when they didn't know I was sitting in front of them during a presentation. I wanted to cry. We went to countless doctors and tried countless interventions (Eucerin, gluten-free diet, oatmeal wash, allergy nose spray, etc., etc.) He was tested for allergies and had the tiniest reaction possible to our dog, and used the nose spray for a short time without much improvement. Then he had his deviated septum repaired, and like magic, his face healed and never broke out again. WTH? He hasn't used any medications or creams in the 3 years since, and his skin is perfect now. I wish you the best of luck. It sounds like you are doing your best to educate yourself and take care of the sweet angel. Try not to let the idiots hurt you. Try memorizing a mantra to say to people, "Thanks for wanting to help" and just ignore the rest. Good luck! I don't know why people feel so free to be rude about this kind of thing. I can't believe the teachers made fun of him too! We have been very lucky with Zora's teachers at her preschool, they have been wonderful. But even other kids don't understand and they will ask what is wrong with her face. She isn't quite old enough to be upset about it but she will be soon. I am so sorry to hear about the eczema. It is so frustrating to deal with. I'm told that kids often out grow it. Though both my daughters have it and have not outgrown it, yet. I hope it all calms down and she and you feel better. We've noticed that eating chocolate doesn't help and SBC honey and propolis gel helps a little (when we are not applying topical steroids.) But all the links are kind of vague. Still, as a mom you just keep trying anything and everything. Your daughter has a gorgeous face. 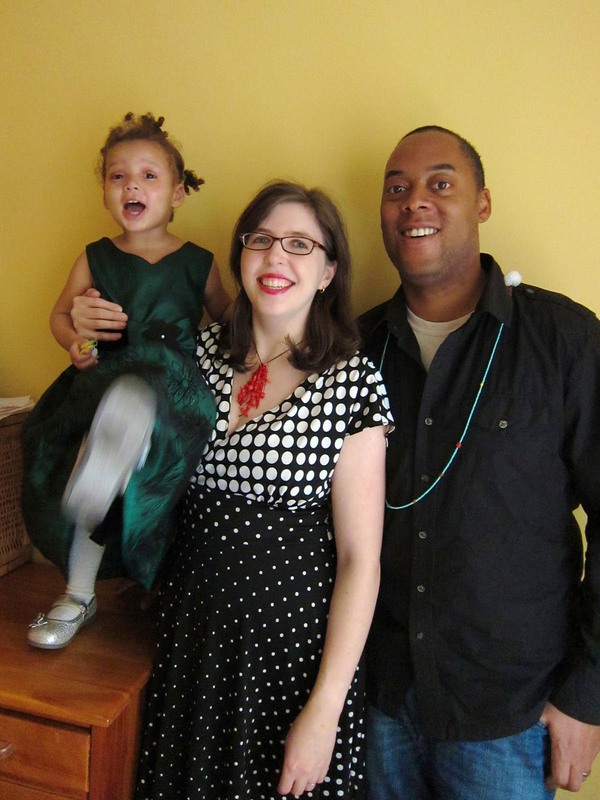 Also, my husband and I were ill constantly when our first daughter was a toddler. There are a couple of years that I think I sort of missed altogether because we were so ill most of the time. We are back to normal now. So hang in there! I suffered from eczema as well as a kid, though not as bad as your daughter. Luckily, it vanished after some years. It nowadays sometimes returns when I'm stressed, a sure sign that I need to take a break. And yes, knitting helps. Hope you get some more sleep soon! Thank you Fel! I have heard that it does go away in about 50% of cases when kids get older, so I have my fingers crossed... My husband also had it as a kid and barely ever has any now. Oh bad luck. I have nothing to add on the ezcema or illness fronts that hasn't been said already. But I can attest to knitting as therapy. I have bad depression but I learned to knit in the past year and I really do find it terribly soothing. Oh thank you Lucy! I'm glad you get some relief from knitting as well! I'm so sorry to hear things have been challenging of late, Mikhaela. Glad to see you're finding solace in creativity -- great therapy if you ask me. Hang in there! -Spreading a little extra love and luck your way. I'll read whatever you write here, whenever you can. Thank you Kimersew! I appreciate it very much! What a beautiful family photo! Mikhaela, I've been thinking about you a lot since your last post; it's good to hear how you're doing. Glad you found your needles! At the lowest point in my life thus far, a kind stranger told me, just remember this situation you're in is temporary. She was right. Another nurse held my hand and told me to find Jesus, but that's another story. Hope to see you soon. Oh thank you Lee! That first stranger gave good advice... it's true! 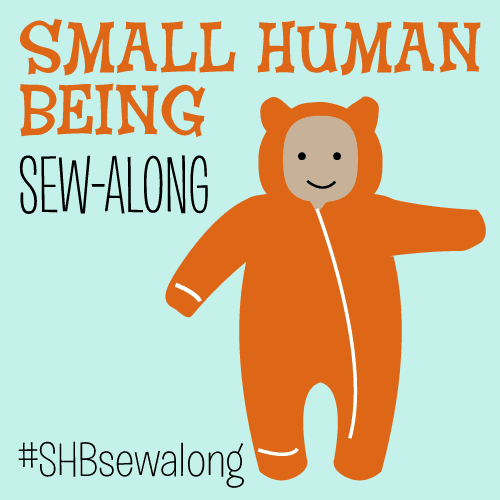 I hope we can have a sewing meetup soon again! So glad to "hear" from you! I'm glad that you're finding some time to take care of yourself lately. My darling friend, I am glad to see you are finding some quiet moments to yourself with knitting. I love the way my brain just shuts off and my anxiety calms down immediately. I am thinking of you and your precious girl, and I hope the new regimen continues to work out for you! XOXO! Oh my goodness you are so sweet! I thought of you the other day when I finally found the time to watch "The Angels Take Manhattan." I kinda cried when Amy got zapped back in time to be with Rory. That is such a perfect description, Lauren! Also, your Central Park Hoodie is super-cute, even if you aren't entirely happy about the yarn. I'm still reading! Hope things start going better for you and the knitting helps! I know what it's like to drop the sewing/crafting for months at a time (for different reasons, though) and it does feel better to craft - even a little, so good luck - I hope you can squeeze even a little bit in. Thank you Kate! I hope so too! (((HUGS))) I'm glad to see so many of us commenting! We'll still be here when you are ready for us. I'm sorry to hear about your struggles with your wee one. I know I find it so frustrating when people assume they know the answers to my problems, even though I recognize that it is generally well meaning, it's still distressing. Struggling with a child who has special needs, no wonder what they are, is a road that each parent walks in their own way. I know you and Masheka will find the right road to walk for your family. Good luck. I am so sorry to read that you and your family have such a stressful time. My little sister had eczema issues when she was little, and my husband does now. It's so difficult to deal with even as an adult. You are doing an amazing job, and I am sure you help your daughter, even if it might feel if nothing helps. My grad school roommate had eczema and severe allergies (peanut, nuts etc.) throughout her life, and she grew up to be a successful woman able to live with the difficulties, and I am sure your daughter will too. Although I hope she'll "grow out of it" even if that is much more easily said than done. Good luck with everything and I hope you will keep knitting and sewing (and blogging). Oh, what a hard time to be going through. I"m so sorry. Also, I'm going to be one of those annoying people offering advice, but have you looked into hazelwood necklaces? Some families have success with them, including my sister for her daughter. I really hope things start looking up. Best of luck. Oh Mikhaela! How stressful and exhausting for you and your family! Very different, but last year around this time I had to make some difficult decisions related to my own allergies. Having a creative outlet definitely provided solace for me. I hope that even a few rows a day can help you tap into that same well of calm and strength. You may have already tried this, so apologies if you have... but my 5-yr old daughter has eczema, though not severe. I'd read about "bleach baths" and was skeptical (http://eczemacenter.org/familyresources.htm) - and never tried them. She then began swimming lessons in a heavily chlorinated pool. To my amazement, her eczema cleared considerably. If you haven't considered this one, maybe it's worth a try? Oh please do NOT apologize! We do indeed use dilute bleach baths a few times per week. We've gotten mixed results—they seemed to be miraculous the first few times (especially on the infected areas on her arms and legs) but she still itches and scratches quite a bit. The new regimen on her face that seems to be working so well is based on a similar principle—we do two compresses of dilute apple cider vinegar on her face (for five minutes on all affected areas, which is everywhere except her nose and forehead)... then apply steroid cream and Vanicream. She's also on antibiotics for a short course. That's encouraging! Hang in there! Aww, poor girl! I hope things continue to get better. Best wishes to you and your family. Interesting to read about the apple cider vinegar compress. My husband has issues with severe eczema on his hands and feet (or maybe psoriasis, the doc can't tell us for sure). He was getting some relief from steroid shots every three months but they have now quit working. We're looking at trying some natural remedies. what a lovely holiday family picture!! best wishes to you and yours. So sad to read about your little girl's and your troubles! My thoughts and prayers are with your family and I hope knitting and creating continue bringing you comfort and solace. Hang in there! I knew when you mentioned eczema that it would be food allergies. I'm glad that you have some progress on that. But, hey, you're still in my feed reader! M: I can feel your stress in this post. So, so sorry. This must be outrageously frightening and tiring and demoralizing. But I am confident things will improve. Maybe not quickly, maybe not all at once - but you are obviously going through one of those very challenging phases (understatement) that tests on every front: money and work and sickness and child health worries. I have little experience of severe eczema - my sister had it fairly seriously on legs and arms (she's the one with serious allergies I've mentioned before). I had it too, but not badly. Both of us outgrew it. What I have had tons of experience of is the endless sickness that pervades when you have a young child in daycare. Man, I was as sick as a dog for the better part of 3 years - and I was often sick for a good six years. M would get sick for 2 days and I'd have it for 10 days and then the cycle would start all over again. Being constantly under the weather was exhausting. I was miserable, depressed (I'm a terrible sick person) and very anxious. Now, add to that your concern for little Z and it's a wonder you are knitting at all (and, btw, GOOD for you! ), much less reading and writing and sewing. Seriously, crafts are the luxury of the woman who doesn't work full time with a baby. I couldn't have started to craft until my daughter was 8 or 9 - I just didn't have the mental head space. I JUST posted about how crafting & wearing my me-makes has kept me from being more depressed! I really sympathize. I have a dozen food allergies & intolerances, so I know how difficult things can be. I also have dermographism (really dry skin that leads to my cells dumping a load of histamine into my blood stream & me getting red & itchy). Years ago a dermatologist told me to use baby shampoo because it doesn't dry out the skin as much. Not sure how well it worked, but it's worth a try. Also, I recently started using raw African black soap. It's made from different oils & is supposed to be good for eczema & other skin conditions. It's too soon to say if it helps, but it could be worth a shot. The reviews I read online rave about the stuff. No particular brand. Just a thought, could she also be allergic to something in the treatments? My brother in law had shingles on his forehead & the rash lasted for months. Turns out the medication had some new chemical he's allergic to & was making everything worse. Best of luck! Hopefully things get better soon. I hate how when it rains it pours. Oh, hugs Mikhaela. I'm sorry you've been struggling so much. I would gladly sit with you and listen to your frustration. There's no easy answers for any of that (even in CO where I highly suspect it's a status symbol to be a celiac), but I hope that you find some hope through the process of all of this. And I hope you and Z start feeling better. I have a friend who took an extended holiday in South America several years ago, and one of the most beautiful things she remembers was being in a slum and seeing someone's apartment whose outside wall had been partially obliterated and was open to the elements. She says that even in that utter lack, that person had taken the time to paint the inside of the apartment a vivid green; somehow in the pain of existence, making something beautiful was somehow humanizing and made things just a little better. I hope your knitting does that for you--your knitting IS beautiful. I have no doubt that you'll figure this all out; for now, when you're in the middle of it, I'll pray for your peace and that you can sleep. I'm sorry things have been so difficult for you and your family. I hope they get better soon. The knitting as therapy thing makes so much sense. Oh, man, I'm so sorry to read about how difficult things have been for you guys lately. I can't imagine how endlessly frustrating this must be for you. You're in my thoughts. I hope you're able to carve out some time to do things that are relaxing and meditative (and I hope you all will start to sleep better SOON). Life can get extra-horrible when little kids are unhealthy and the parents start to fall apart from the physical stress of taking care of the kids, and you still have to work and make dinner and clean the home... Not to mention the constant worry. I have no advice, only sympathy, because I'm there, too. Some days, I think it has to get better because it just can't possibly get worse... Don't give up! I deal with health problems and knitting is a huge help. When you're working so hard to just survive it's very rewarding to have something tangible to show for the day or week. Knitting has kept me sane. I'm sorry, I realized that I gave advice anyway! I've turned into my mom!! Ack!! Oh, god, I'm so sorry things have been so rough! You remind me how lucky I am to have kids without life-threatening conditions. And I totally get the "helpful advice" fatigue. /sigh. I really hope that you do find *something* that works, for everything. I love the idea of knitting as meditation. My youngest reacts REALLY badly to mosquito bites, and in every birthday picture for several years, she looks like she has chicken pox. So I get the triumph of the holiday photos. :) you all look awesome. Wow. I hope everything settles down real soon! And Z has gotten so big since I last saw a photo. A real little girl, no more baby! Probably assvice, but I have mild eczema on my hands and feet and so far, Cerave helps a lot. It's overpriced drugstore lotion, but you can find it online for less. A friend of mine who has eczema on her face uses it there with a topical steroid. Eucerin and all the stuff that other people swear by didn't help me at all. You should also check that she isn't allergic to any part of the new regimen. I was very sick with an autoimmune condition in 2007, and got sicker and sicker for 6 months, with higher and higher doses and various formulations of the main treatment option, before the doctor realized that I was allergic to that drug. I got better after I stopped taking it. I hope that you and she feel better very soon! The holiday photo is awesome. I have just added you to my reader as I lost you for a while. The timing is incredible as we are in the middle of the sleepless nights with a toddler with severe eczema who scratches so much he can't sleep. It is exhausting! We have just started a new regime of Steriods which seems to be working -hoorah! The crazy thing is that when we visited NY from Melbourne Australia in June, both my son's and my skin conditions cleared up! Maybe the reverse would work for you - fancy a trip downunder? Seriously, I have some small idea of your pain and I hope you find something soon that works for your daughter. "Sleep is over-rated...what I would do for a weeks worth!". It turns out this is a pretty long comment, but I hope you will have a chance to read through and that it helps. I have been reading through the backlog of your blog for the past few days and I am hooked! It's fantastic. Anyway, I know you posted this a long time ago and I'll admit I haven't read through the comments on this thread or through any of your newer posts (aside from the past couple of days), so I don't know if you have found a resolution, but I had severe chronic eczema as a child. SEVERE. Chronic. Eczema. I know what it's like to be her. Honestly it made my childhood a little bit difficult because we could not find anything that truly took care of it, and because I was hyper aware of my very visible rashes, I felt ostracized when kids asked if they would catch it if they touched me. I don't say that to scare you, although I think it may be important that you know that those things may happen to your daughter. I say it because I feel like I can offer up at least a couple things that somewhat improved my situation so that the itching was, at least, livable. Essentially: bathing. I know you bathe her, and I know your doctors have given you techniques for bathing her. I just wanted to offer what helped for me. Some things you may want to try: oatmeal baths, bathing with dollar store foamy Gillette shaving cream instead of any kind of soap, using lukewarm water and keeping the duration to "less than pruny". Also, I have gotten in the habit of lotioning everywhere immediately after getting out of the bath/shower every time. This helps a lot with keeping the rashes happier. I am an adult now but my eczema never went away, although it did get better. A side note here is that you should definitely be using free and clear or "sensitive" laundry detergent. (I am sure this is not new to you, but it made a huge difference for me.) No perfumes or scents! One last note you may find interesting - I had surgery when I was 15 and I was required to have no eczema anywhere near the points of interest (essentially my entire torso) or my surgery could not happen. At the time I still had some pretty serious rashes. I took a 30 minute lukewarm bath every night, and a few times a week in the morning as well, washed with the shaving cream and slathered on the lotion. Within 6 weeks of diligent following of this schedule, I had no rashes. I hope her eczema improves and that you can once again get back to sewing and knitting! Thank you Meagan! Your advice is all excellent... we ended up doing a great hospital program with my little girl in Denver and the BIGGEST thing was long daily baths followed by a huge slathering of Vanicream. It has made a SERIOUS difference!!! Pavlova Presale! + Small Sewing Updates!